One of the major issues repeatedly brought up by Donald Trump during his presidential campaign was China. Promising to take a harsh stance against Beijing, the president-elect called it a “currency manipulator” and claimed that it was “stealing” American jobs. Breaking with decades of precedent, Donald Trump has spoken to Taiwan – which Beijing sees as part of China – putting the status quo at risk. Experts, however, warn that a confrontation between the two powers is as dangerous for the US as it is for the Asian giant. Will Trump make good on his threats against China? And is there a real danger of a military showdown in the Asia Pacific? 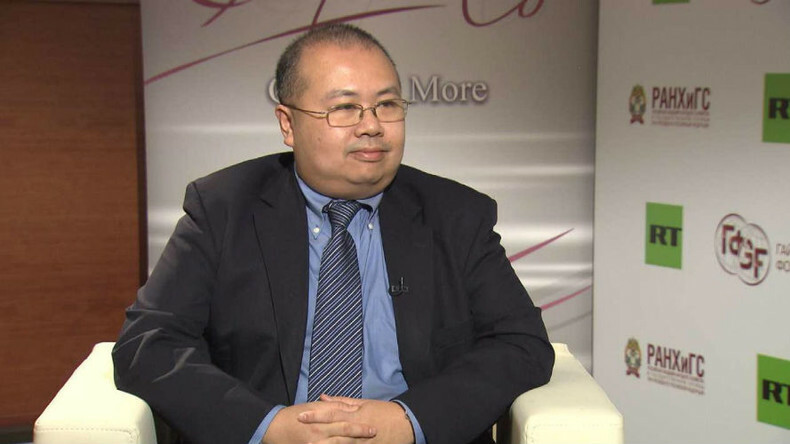 We ask a professor at Johns Hopkins University, and author of The China Boom – Ho-Fung Hung is on the show. Sophie Shevardnadze: Now, President-elect Donald Trump has vowed to call China a currency manipulator on his first day in the White House - what happens, if he really does that? Ho-Fung Hung: Right now I don’t think it is fair to say that China is a currency manipulator, because what China has been facing in the recent months and recent 2 years is a devaluation of the currency that China’s government doesn’t quite want to see, because it is driven by capital flight. Some wealthy people and companies are taking their money out and then driving down the currency, and instead of manipulating the currency to push it down, the Chinese Central Bank has been doing a lot of things to try to stem the capital flight and support the currency. SS: So, I’m wondering, is Trump just playing tough with China to bring Beijing into some kind of trade negotiations - what does he want from China? HF: It is the thing that many people have been asking lately, that, in election campaign, he had a lot of heated rhetoric against China and China trade, among other things - climate change and other things, and Obamacare and so on and so forth, but once he was elected, it seems that some of the rhetoric is not going to certainly materialise into policies. So, some people are wondering, what is the rhetoric and what is the real thing? We can’t say for sure, until the inauguration, until he’s in power - but one concrete thing that he has done in the last few weeks and the last few months is that he has appointed and he created a National Trade Council which is parallel in some way to the National Security Council and National Economic Council, and a National Trade Council is going to create, and then he appointed Dr. Peter Navarro who has been a very vocal critic of China trade practices in the past. So, it is some sign that Donald Trump might take a tough stand on the negotiation with China. SS:Yeah, that’s another question, because his cabinet members share more hawkish views than he does. So who’s going to take decisions - he or his ministers? That’s another question. HF: Yeah. One interesting thing is that in the campaign he seemed to have an isolationist stance towards Asia-Pacific and he criticised some of the U.S. allies for not soldiering enough financial responsibility and people worry that once he’s elected that he might abandon some of the Asian allies, like Japan and South Korea. But once he was elected he seemed to backpedal on this position and try to reaffirm the U.S. allies in Asia that U.S. is still in the region. SS: We’re going to get back to the whole security umbrella issue, but right now I still want to talk a bit about the back-and-forth that’s going on with China-America. In response to Trump’s pledge to impose crushing tariffs, Beijing threatened to limit the sale of Boeings and iPhones - can Americans afford to impose any sanctions at all? How much damage can China do to the American economy? HF: Many people worry that if the incoming Trump Administration is going to impose tariffs and sanctions on China in terms of trade issues, China might retaliate and give hard time to American businesses in China. Having said that, we need to put that in the longer context, that, for example, the American Chamber of Commerce in China has published a report, earlier in 2016, showing that actually many American businesses in China has already been showing frustration with the situation in China, that the regulators and China’s state-owned companies are not competing with them fairly and quite a large percentage of them already consider leaving China… so, it was already happening, before the election. SS: That was going to be my second question, because, sometimes this is just a war of words, like you’ve said, for now. But I wonder if it affects the investment world? Would it affect the investments in the American and Chinese economy or the investment world doesn’t care? HF: What is interesting is that even before the election there was a quite a strong trend going on, that some, if not many, American businesses in China have been complaining that they are treated unfairly by the regulators and by the unfair competition by state-owned enterprises in China, so these kind of trade conflicts are already emerging. President-elected Trump, soon to be President Trump, his rhetoric might heat up some of these trends and conflicts, but I’m cautiously optimistic in a sense that… what’s determining the long-term development of U.S.-China relations in the long run is the structural issues, rather than some eventful, colourful rhetoric of particular politicians. SS: What I’m wondering is that because the two countries are so intertwined economically - China owns a lot of American debt , it provides cheap labour for American exports - can America damage China without damaging itself? HF: To a certain extent, whoever wants to wage a trade war with China needs to have a calculation about what U.S. can gain from it and what U.S. could lose, and then the calculation about what U.S. would lose depending on how much China would do to retaliate. So, it is a kind of dilemma situation, that no matter how much and how big a step incoming U.S. administration is going to take against China, it carries some kind of risk, and there’s a kind of a process in early months of the administration, that Washington is going to test China intention and resolution and determination to retaliate and how much pressure from the U.S. China can withstand, how much China would be willing to compromise. I think, in the early months it’s very crucial that both Beijing and Washington is going to test each other’s real intentions, the bottom line. SS: What happens if China decides to diversify and distance itself from its investment in the American economy, will that ease the US-China tensions or, on the contrary? HF: There’s a structural constraint to what China could do to diversify. Right now, and for the last few decades, actually, the China boom, the Chinese economic miracle, is very much grounded on the globalisation driven by the U.S., and to a lesser extent, European consumers. China has been running a huge trade surplus with the U.S. and with Europe because China has been exporting all these finished consumer goods to the U.S. market. At the same time, China has been running a trade deficit with many other countries that export raw materials, commodities, components for the machines to China. So, this whole status quo of globalisation is driven very much by American consumers and also European consumers. When U.S., and also Europe, begin to resort to protectionism, to try to protect jobs and revive their own manufacturing - then China will be forced to diversify, to find new markets. But, we have been in the kind of part-dependence that China has been and the whole world has been dependent on American consumers so long, than when Americans try to play with with the idea of going back to protectionism - then it takes time for China and other exporters to find new markets and new consumers. SS: Economic integration and interdependence, as history shows, doesn’t always mean peace. Do you think, what we have right now between China and America, can escalate into actual conflict? Despite the ties? HF: It is what many people are worrying about around the world. I don’t worry about the trade war side of the conflict, because it is about jobs, it is about economy, it is about economic growth, and then, in the end, if it escalates into overt conflict, everybody will lose, and everybody knows it. Washington knows it, Beijing knows it. So, with these economic issues, I’m optimistic that it can be solved in an economic way. But what worries me is the situation in the South China sea, which is beyond economics - it is about geopolitics. U.S. stance has been very clear that it has the determination to maintain the trade lane in South China sea open to all, and U.S. has been already building up its military presence in the region, while China, at same time, sees these territorial claims over the South China sea as a kind of a core interest of China. It seems that it is not easy for any leader in China to backpedal from its current claim of the sovereignty ownership of the South China sea. So, these pieces of ocean and islands really are kind of things that I would say that are possibly leading us to conflict. It is a real possibility there. SS: Trump’s pick for state secretary - Rex Tillerson - has said China should be denied access to its artificial South China Sea islands - what actions can the U.S. take to achieve that? HF: If he’s serious about he has said, if the U.S. Navy really takes some action to actualise what he promised to do in the hearing, that it will involve some blockade, intercepting some Chinese ships, transporting materials and equipment and personnel to those already militarised islands - in such case, it will create a very-very delicate situation in which, if the U.S. warship really tries to intercept these China ships going to the islands and the Chinese do something to fight back - it can turn into real skirmishes and then it can easily develop into an overt conflict. SS: Trump has recently controversially spoken to the President of Taiwan - putting the One China Policy into doubt. China‘s state-run newspaper Global Times has warned that Beijing will retaliate or revenge, if that policy will end. What kind of revenge could we expect from China? HF: I don’t think that Beijing would think that it is wise to take on U.S. directly. From a Beijing’s perspective, it would find it quite risky to retaliate by risking a direct confrontation with the U.S. military presence in the region, because Beijing has been very cautious over the years, and I don’t think that they can calculate or make a conclusion that Beijing could win in overt, direct confrontation with the U.S., and what Beijing would do to retaliate against any U.S. action against it over the South China sea or other issues is to increase pressure on the U.S. allies in the region to force these U.S. allies to take sides. For example, in Singapore we already have recent issues with the shipment of Singapore military vehicles, shipping back to Singapore after military exercises in cooperation from Taiwan via the Hong Kong port, and then the Hong Kong port has seized the vehicles, and now it is reported that China is demanding - if the report is accurate - China is demanding Singapore to recognise China’s policy and stop military cooperation with Taiwan if they want to get these vehicles back. SS: Do you think that Taiwan call was an orchestrated move by the new American administration? Is Washington readying itself for a serious shift in China policy? What shift would it be? HF: I can’t tell for sure, and nobody can tell for sure, because there’s speculation - I think there’s some ground to it - that the incoming administration might not be serious about the Taiwan issues, but they want to establish a stance to start with in the upcoming negotiations with Beijing over trade and other economic issues. So, we will see. SS: You’ve said that China is very cautious when it comes to blaming Trump - they usually say “Well, he’s an inexperienced politician” - do you feel like China is going avoid confrontation with the U.S.? HF: I think a rational side of Chinese leadership is to avoid direct confrontation with the incoming Trump administration, with Washington, and as for the controversial phone call between President-elect Trump and Taiwan president Tsai Ing-wen, that if you look at the Chinese official media, they have some criticism of the Trump administration, but mostly they put the blame on the Taiwan side. They are very careful not to put the direct blame on the incoming administration’s side and they just blame them for being inexperienced and implying that it’s the Taiwan’s side that is preying on the inexperience of the incoming President - so they are very careful not to put the direct blame- they want to maintain the dialogue, and a channel for negotiations open. SS: On the other hand, China has since sent an aircraft carrier in the strait of Taiwan in a show of strength - can the pro-Taiwanese American stance actually play out into a conflict? HF: You know, over Taiwan, and even over the territorial dispute with Japan at the same time, in which Chinese military, fighter jets have been quite active lately… but on that side I think that it is more about grandstanding, a gesture rather than a real thing, because any sane mind in the Chinese policy-making circle will not think that China has the capability to take Taiwan militarily now. But for the South China sea - this is another issue, because in the South China sea there are a lot of islands that China has effective control of, and it is already putting weapons and anti-aircraft equipment there. So, China has effective control over there already. If the U.S. really pursues the policy of denying China access to those islands that China has been already doing a lot of things on - it will really risk an overt conflict. So, South China sea is the main concern here. SS: But also, I’m thinking, because Trump spoke so much about the fact that he’s going to be domestic policy oriented, that I’m thinking he’s going to abandon America’s pivot to Asia, he’s already dumped the TPP trade pact. Wouldn’t China get more freedom of action in its own region? HF: You’re right in pointing out the fact that President-elect and soon to be President Trump’s first priority would be domestic economy. It is domestic economy, jobs, economy growth that will determine whether he’s going to have a re-election or win election 4 years later. American public, basically, is prioritising these issues over South China sea, very much. So, in the end of the day, I would guess that it is the economic conflict and economic cooperation between U.S. and China that Trump administration is going to put most emphasis on. SS: But also, just because during the Obama administration China was worried about this famous “pivot to Asia” - I spoke to a prominent China scholar David Shambaugh and he told me that it’s a very ambitious project, but it’s unsustainable in long-term because America doesn’t have resources to sustain the whole pivot to Asia, if they want to maintain their presence in other places around the globe. So, maybe, China is overestimating the whole American threat? HF: The China’s calculation and estimation is that South China sea is far away from the U.S., and South China sea is very close by to China - and if there’s an overt conflict between the U.S. and China, the U.S. popular opinion won’t support it for that long. So it is China’s calculation, but on the U.S. side, U.S. also has another calculation, and it is that many U.S. allies and friends, new friends, old friends - including, for example, Vietnam, and Myanmar - many of these countries are worried about China’s increasing assertiveness in the region, so they are looking for U.S., who is the only power capable of actually counterbalancing China’s military buildup in the region - if U.S. didn’t do enough of supporting these U.S. friends, old and new, in the region, then the U.S. credibility in the whole world would be on the line. So, it is the U.S. calculation that… on the one hand, if there’s an overt conflict with China and it is prolonged, then the public opinion will have a strong backlash against it. At the same time, if the U.S. don’t do anything over these issues and China makes South China sea China’s lake - then U.S. credibility among its allies, not only in Asia, but around the world, will be at stake. SS: Chinese neighbours like Japan, South Korea rely on the American military for protection - Donald Trump has questioned this ‘security umbrella’. Are these allies an asset or a burden for America? SS: If there’s no conflict between America and China, like many predict and just American military role in Asia-Pacific wanes away, slowly - how will that change China’s ambition in the region? HF: I think China’s calculation will be like the U.S. - that it’s balancing its geopolitical interests and its economic interests, and they have quite a delicate balance to strike because in terms of geopolitics, if the Chinese leadership is seen as being weak in defending its territorial claims in the South China sea and elsewhere in the region - then the rival factions within the party and popular opinion in China would have a backlash against it, and whoever will be in power will find themselves in some kind of trouble. So, geopolitically, China at least needs to have gestures, at least have appearance that Chinese government has been doing a good job in defending its territorial claims, but at the same time, any kind of conflict or any prospect of conflict, any prediction of conflict can take a toll on economics, and then - because China is not in a great economic shape right now, it is in a kind of prolonged slowdown, the financial markets is not stable and there’s capital flight - so if this kind of war-prone gestures and appearance continues to escalate, it will take a toll on economy. So, I’m, honestly, sympathetic with the position of Chinese leaders right now, because they are already in a delicate balance, and they have to act very carefully to strike the right balance. SS: Finally, Trump has repeatedly said that he wants good relations with Russia - but Moscow is very unlikely to support any of Washington's anti-China steps. How do you think the whole new triangle, America-Russia-China, will play out? HF: It is interesting, because from the standpoint of Russia I would guess that priority, of course, won’t be too much on South China sea. That is far away from Moscow, and Moscow and Russia will be more concerned about is the U.S. military posture in Eastern Europe, for example. So, what matters… and also, in the Middle East, in Syria and over all of these kind of issues that Russia already has a direct involvement in. So, what ultimately affects Russia-U.S. relations won’t be too much about South China sea and Asia-Pacific. It is going to be much about what incoming administration is going to do in the Middle East, in Syria and in Europe, particularly in the Eastern Europe. SS: Professor Ho-Fung Hung, thank you very much for this interview.